The Montana Budget & Policy Center released Medicaid Expansion Works for Every County in Montana, a report highlighting county-specific benefits from expansion including enrollment, preventive screenings, behavioral health services, and businesses with employees enrolled, and other statistics. In 2015, Montana passed the bipartisan HELP Act providing access to Medicaid for adults living on incomes below 138 percent of the federal poverty line (for a single individual with annual income below $16,750). Now, 96,000 Montanans have gained access to health coverage. 1,629 individuals have accessed workforce development services provided by HELP-Link. 7,034 received colon cancer screening, averting 2,554 possible cases of colon cancer. 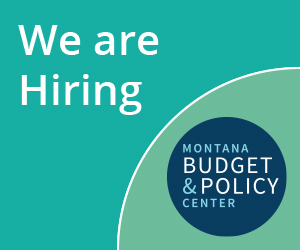 The Montana Budget & Policy Center is a nonprofit organization providing in-depth research and analysis on budget, tax, and economic issues. Our core focus is publishing credible, timely, and easy-to-understand reports on the fiscal policies that most impact Montanans living on low- and moderate-incomes. To learn more about MBPC, visit our website www.montanabudget.org.